Say hello to one of Downtown Orlando’s newest restaurants, and quite possibly the newest hot spot in the area. Tin & Taco is the all new custom and craft taco bar on Washington Street in Downtown Orlando serving up craft tacos and craft beer. This space used to be occupied by a place called “What's Your Beef” that was a deli with breakfast and lunch options. 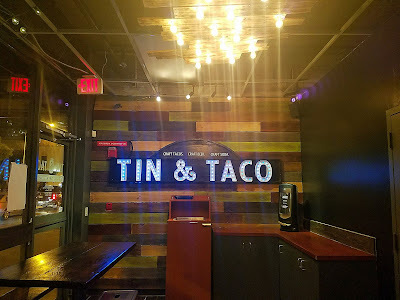 Tin & Taco offers tacos, chips and salsa, queso, canned craft beers and craft soda from Stubborn Soda on the fountain tap. Everything on the menu is available as a taco, a burrito, a bowl or a salad... and for your late night drinking excursions, you can even get your menu selection put into a bag of Doritos. In Mexico they call that Dorilocos, and it’s quite the Mexican street food craze. Rob Bair was a former part owner of Gringos Locos. He had the idea to start Tin & Taco as a more “grown up” version of Gringos with a focus on quality eats and craft beers that are good anytime of the day, not just after you have had way too much to drink. The name comes from a basic idea: Tin = Craft beer served in cans only, and Tacos = Tacos. I have been twice, and my assistant at Tastes of Orlando (Katie Hinton) and my wife, who both work downtown have practically made T&T their go to restaurant for lunch. So far, it’s been nothing short of awesome. A look at the beer cooler full of craft beers from local breweries, like my favorite, Crooked Can, to more commonly known craft beers like Lagunitas and DogFish Head. Chips and house made salsa with a side of Beer Cheese Queso. T & T makes a different queso every week using various beers from the cooler. I tried the Boom Boom in burrito form for my first visit. The Boom Boom is certified Angus ground beef, pico de gallo, potato sticks, spicy boom boom sauce and rice. If you get this as a bowl, it is served over shredded lettuce. Very fun to eat and very tasty. The Chick Magnet in bowl form features shredded chicken, pico de gallo, shredded jack and cheddar cheese, cotija cheese, cilantro garlic sauce and is served atop shredded lettuce and rice. Really great flavors all around. The Tacosaurus on the left is full of ground beef, lettuce, jack and cheddar cheese, pico de gallo, cotija cheese, and most importantly Crushed Doritos. On the right is the Hail Caesar with chicken, Applewood smoked bacon, potato sticks, Parmesan cheese and Caesar dressing. What's not to like? B-O-B taco on the left with chicken, Applewood smoked bacon, pico de gallo and homemade ranch. Notorious P.IG. on the right is made with slow & low braised pork, craft beer queso, spicy boom boom sauce, salsa and cotija cheese. Both were exceptionally delicious. All taco tortillas at T&T are first covered in cheese, then grilled just enough to make a cheesy crunchy crust. The food here is not only delicious, but it's fun to eat in a cool atmosphere. Yes, this place is very small with a limited amount of seating, so depending on what time you come here, you may be sitting at a communal table, or your best bet may be to get your food to go. The food comes out in a timely fashion and the staff here is always on top of things and can help answer any questions you may have about the menu. They are always changing the beer queso and adding new specialty tacos throughout the month, so stop by sometime soon and have a burrito, a bowl, a taco, or just get it all put into a bag of Doritos. Tin & Taco is open from Monday to Thursday from 11:00 am until 9:00 pm, while staying open late on Fridays to 3:00 am. Saturday hours are from 6:00 pm till 3:00 am and they are closed on Sunday.